Your Search For The Perfect Gift For Kids Ends Here! + How do I buy / gift a Flintobox E-Gift Card? Enter the name and email address of the person you want to send the Flintobox E-Gift Card to. Select the value of the card you would like to purchase, then click ‘Proceed To Pay’. You'll now see the payment options. You can pay by Credit Card / Debit Card / ATM Card / Net Banking / Paytm. Proceed to pay using your preferred choice. If you need to make any changes to the E-Gift Card value, you can go back and modify it. Complete the checkout process to receive an email with the E-Gift Card details. + Does my Flintobox E-Gift Card expire? 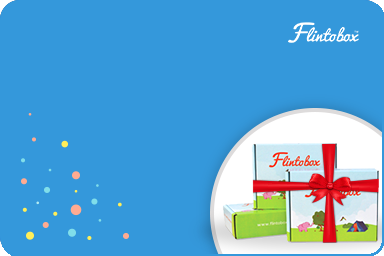 All Flintobox E-Gift Cards expire 1 year from the date of their creation. + Is there a limit on how many E-Gift Cards that can be used per Order? You can use only one E-Gift card per order. + How can the recipient use the E-Gift Card? The E-Gift card number and the link to redeem the gift will be sent to the recipient via email. The recipient only has to click on the link, enter the E-Gift card details, select the age group and select the subscription option (the applied E-Gift card price will be mentioned). In case the order value is more than the E-Gift card value, the remaining amount can be paid by them using Credit Card/Net banking/Debit card/Paytm. E-Gift Cards can be purchased on www.flintobox.com using the following payment modes only - Credit Card, Debit Card, Paytm and Net Banking. E-Gift Cards cannot be used to purchase other Flintobox E-Gift Cards. E-Gift Cards cannot be used to make bulk purchases on the Platform. Only one gift voucher can be used per order. You cannot use multiple gift vouchers for a single order. If the order value exceeds the E-Gift Card amount, the balance must be paid by Credit Card/Debit Card/Internet Banking/Paytm. The Cash on Delivery payment option cannot be used to pay the balance amount. E-Gift Cards will expire after 12 months from the date of issue and any corresponding unused balance shall be forfeited thereafter. E-Gift Cards cannot be redeemed for Cash or Credit. You are solely responsible for the safety and security of the E-Gift Cards. Flintobox.com is not responsible for any acts of omission or commission if E-Gift Card is deleted, gift card number is stolen or used without permission. Once the E-Gift Card has been sent to you, you are bound to protect the E-Gift card number as confidential. In the event of any misuse of the E-Gift Card due to loss of any such confidential details due to the fault of the purchaser, Flintobox shall not be responsible for the same and no refund will be issued. Validity of E-Gift Cards cannot be extended; new E-Gift Cards cannot be provided against expired/unused E-Gift Cards. E-Gift Cards once purchased, cannot be cancelled by the Purchaser. Any cancellations shall be at the sole discretion of Flintobox. You can only purchase 100 E-Gift Cards in a 30-day period and the aggregate value of the E-Gift Cards purchased cannot be more than Rs. 100,000/- (Rupees One Lakh only) in a month. Flintobox reserves the right to cancel E-Gift Cards if the same have been found to be purchased using fraudulent means. In such cases, the funds shall be credited back to the same source from where these were received. In the event that the beneficiary/Know Your Customer ("KYC") details as per RBI Guidelines are found to be incorrect/insufficient, flintobox.com retains the right to cancel the E-Gift Card issued. You agree and understand that E-Gift Cards are a pre-paid payment instrument subjected to regulations by the RBI under the RBI guidelines. Flintobox may be required to share KYC details of the purchaser/redeemer of the E-Gift Card and/or any other information with relation to the purchase of the E-Gift Cards and/or transaction undertaken using the E-Gift Card with RBI or such statutory authorities. Flintobox may contact the purchaser/redeemer of the E-Gift Card for any such information. 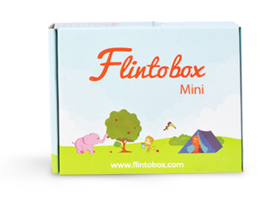 Flintobox's return gifts for kids are like no other - these are meaningful, fun and explorative activities placed inside a MiniBox! Call 044 4010 0400 to place bulk orders for your parties at super friendly prices!